dm drogerie markt belongs to the biggest drugstore chains in Central and Eastern Europe. The first branch was opened in 1976 in Linz, Austria. The head office is based in Salzburg, Austria. 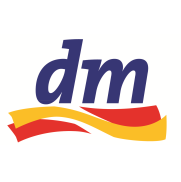 Nowadays dm drogerie markt is respectable chain of stores with over 3,200 stores in 12 European countries and 55 000 employees. At dm Bulgaria work over 500 employees and there are 69 stores in 25 Bulgarian cities. The whole concern along with dm Germany provides a secure workplace to over 55 000 people. For eight years on the Bulgarian market dm has enjoyed an exceptionally high mark from customers. In the assortment of dm Bulgaria are presented over 14 000 items of the best local and international brands that cover a very wide range of high quality products categories: Face care, Hair and body, Decorative cosmetics, Home care, Baby care, Organic food, Food for pets and Photo accessories. Among them, a special place occupies the products of the 22 dm home brands, which are characterized by excellent value for little money.